Jim Quigley had been sober for four years and was one semester away from graduating from Bible college when his stopped car was rear-ended by someone going 50 miles an hour. “I ended up having two artificial discs put into my spine,” he said. He also ended up with a prescription for opiate painkillers. A month after surgery, his prescription ran out, and he quit using. But he fell back into alcohol and drug abuse and, three years later, came back to prescription opiates. Quigley’s previous church had a new pastor, and the man prayed for him, let him use the studio apartment behind his house, and gave him a job doing maintenance around the church building. “About two weeks went by before I finagled a way to get drugs delivered to me,” Quigley said. But Quigley still couldn’t get clean until his cousin found him a long-term rehab place in North Carolina. “They talk about all that God stuff you went to college for, so you might be interested,” she told him. He would go on to graduate from the program, then work his way to up executive director. Today, Quigley works with about 100 addicts a year. He requires his residents read Oswald Chambers each morning, write papers on Tim Keller’s Prodigal God, and take a class on covenant theology. They learn about the medical components of addiction and how to identify triggers. They attend church twice a week, do physical labor, and get random drug tests. Freedom Farm is just one way that Christians are tackling the opioid crisis, which killed 33,000 Americans in 2015, up from the record-setting 28,647 in 2014. Thanks to opioids, overdosing on drugs is now the most common cause of death for people younger than 50. Earlier this month, President Donald Trump declared the opioid crisis a national emergency, in response to a commission report that also called for equipping law enforcement with the overdose-reversing drug naloxone and better tracking of prescription data. In 2010, Americans—which make up less than 5 percent of the world’s population—consumed 80 percent of the world’s opioids and 99 percent of its hydrocodones (semi-synthetic opiates like Vicodin or Lortab). Opiates—which include heroin, codeine, and morphine—are drugs made from the opium poppy. When ingested (through snorting, smoking, swallowing, or shooting up), the chemicals attach to receptors in the brain, blocking it from receiving any signals of pain and replacing them with euphoria. The brain loves this, so it rewards itself with a lot of dopamine, which produces an intense rush of pleasure and the motivation to do it again. Using opiates to replace pain with pleasure has been around as long as the poppy—ancient Sumerians called it the “joy plant.” It’s been causing trouble almost as long, including two major wars between England and China over whether England could supply China’s opium dens (the British won both times), the addiction of Civil War soldiers to morphine used for injuries, and the invention of a German dilution that was supposed to be less addictive but turned out to be heroin. The German drug company Bayer introduced heroin to the United States along with aspirin, but wasn’t alone in believing it to be less harmful than it actually was. In the 19th century, opiates were ubiquitous, found in products as common as teething powder, children’s cough syrup, and menstrual cramping relief. The government attempted to get a handle on things through the 1906 Pure Food and Drug Act (which required labels to note if drugs were “dangerous” or “addictive”), the 1909 Smoking Opium Exclusion Act (which banned the import of recreational opiates), or the 1914 Harrison Narcotics Tax Act (which listed and taxed opium dispensers). But opiates are really effective (“Morphine is hard to beat,” said one Wake Forest School of Medicine researcher working on an alternative), and pharmaceutical companies kept releasing different variations. Knowing the addiction risks, many modern doctors were careful with their prescriptions. Eventually, one Boston University doctor grew curious about how many patients actually became addicted to their prescribed narcotics. Herschel Jick and his graduate student Jane Porter sifted through their records and then wrote an ill-fated, five-sentence letter to the editor of the New England Journal of Medicine in 1980. The two reported that less than 1 percent of Boston University Medical Center patients had become addicted to the narcotics they received while in the hospital. “We conclude that despite the widespread use of narcotic drugs in hospitals, the development of addiction is rare in medical patients with no history of addiction,” they wrote. They weren’t wrong. Recent studies also show that most patients don’t become addicted, especially if their prescription is for less than a week or if they have no history of addiction. Most of those references appeared after pharmaceutical company Purdue Pharma developed OxyContin in 1995, then reached back 15 years to the Porter and Jick study to claim that the risk of addiction to their new drug was “less than 1 percent.” The company touted OxyContin’s time-release feature—the drug can be taken once every 12 hours, as opposed to taking an immediate-release drug once every 6 hours—as another protection against addiction. OxyContin brought in $45 million in sales its first year, leaping to $1.1 billion in 2000 and $3.1 billion in 2010, when it had captured 30 percent of the painkiller market. Johnson & Johnson and Endo Pharmaceuticals joined Purdue in pushing their opioid products as solutions to chronic pain, funding nonprofits that advocated for more pain-pill prescriptions and underwriting continuing-education classes that recommended aggressive pain management. In 2001, based partially on this “emerging and compelling science,” the accreditor Joint Commission told healthcare organizations to better track and alleviate pain, giving the impression that pain—sometimes referred to as the “fifth vital sign”—was being undertreated. Pain prescriptions shot up, quadrupling from 1999 to 2015, the latest year for which the Center for Disease Control (CDC) has records. 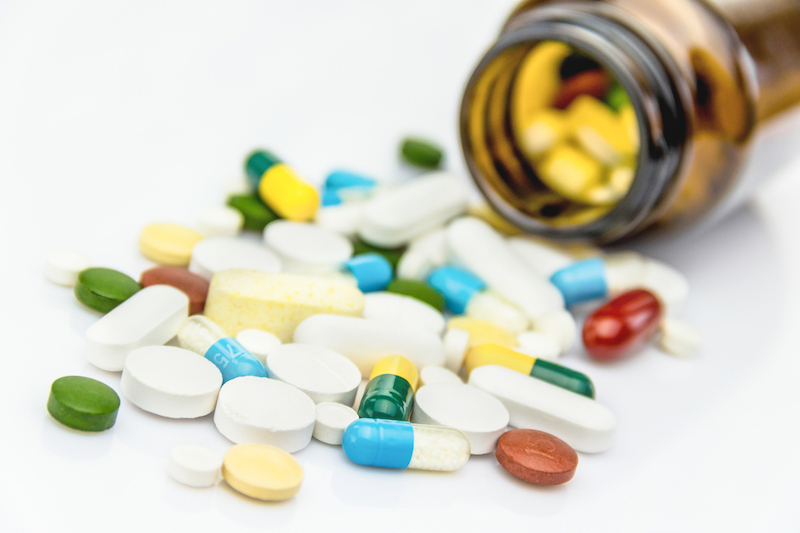 “Previously, opioids had primarily been reserved for severe acute pain, postsurgical pain, and end-of-life care,” the CDC reported. Now, more prescriptions for “chronic noncancer pain” were leading to more long-term prescriptions, which were leading to higher dosages as patients adjusted to their prescriptions and then needed the dose increased. But just saying a drug isn’t addictive doesn’t make it true, and that soon became obvious. In 2007, Purdue—and three executives—pled guilty to making false claims. Purdue was ordered to pay government and civil claims of more than $634 million. Since then, cities and states have filed dozens of lawsuits against five pain-pill manufacturers for deceptive marketing, looking for payouts to “subsidize substance-abuse programs,” University of Georgia law professor Elizabeth Burch told The Wall Street Journal. Purdue agreed to pay Kentucky $24 million over OxyContin marketing; Cardinal Health Inc. and AmerisourceBergen settled with West Virginia for $36 million after filling millions of suspicious painkiller orders. “[T]here is blood in the water at this point,” Burch said. Some believe the opioid lawsuits could swell the way tobacco suits did: In 1998, tobacco companies settled on a $206 billion payout with 46 states. 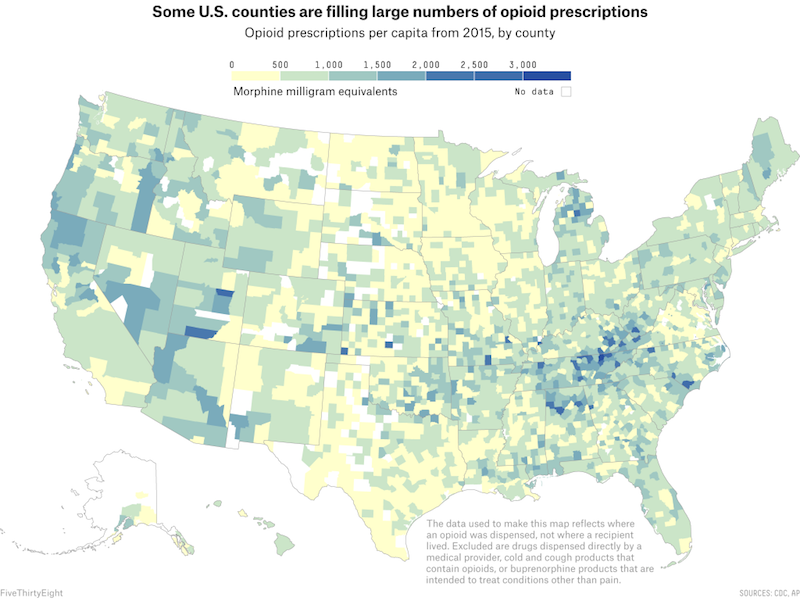 Most opioid prescriptions are being filled in towns and small cities with white residents, many of whom are unemployed or uninsured, according to the CDC. “Rural Appalachia has less opportunity for economic or social mobility,” said Kevin Eames, professor of psychology and department chair at Covenant College. He teaches undergraduate- and graduate-level addiction classes. In addition, doctors may have a faster trigger finger when it comes to scribbling prescriptions for white patients. Studies have reported that black patients receive fewer pain prescriptions, and that some medical students and residents falsely believe black people have a higher pain tolerance. “We know the challenges related to race and difference are a continued struggle,” said Lloyd Gestoso, dean of the School of Social Work at Cairn University in Pennsylvania. While the undertreating of black pain may have protected more African Americans from opioid addiction, racial issues likely affect how lawmakers and the public have reacted to the opioid crisis differently than to crack cocaine, which ravaged African-American communities in the 1980s. “Unlike what was heard during the 1980s and 1990s about ‘arrest’ and ‘incarceration’ of those who used crack and other illicit drugs, the word heard today for opioid users is ‘treatment,’” wrote one African-American journalism professor. The different reactions may also be due to prevalence. More than one in four Americans (27 percent) knows someone who is or has been addicted to opioids; some of them belong to “influential families,” Gestoso said. That familiarity is breeding compassion instead of contempt: Close to seven in 10 Americans said they “understand how someone accidentally gets addicted to opioids,” the American Psychiatric Association reported. Another difference between opioids and crack cocaine or heroin is the legality. “While opioids like Vicodin are prescribed by a doctor for pain management, crack and heroin are distributed illegally through criminal networks,” Eames said. Predominately white and poor, with small towns and cities, West Virginia is the perfect candidate for opiate addiction. So it’s no wonder that West Virginia has the highest overdose rate in the nation. Priestley first ran into opioids when he worked with youth in Charleston. The kids he talked to at the skate parks were using the drugs after they got into a fight, or for a bad report card. Reaching for pain pills “was a consistent pattern,” he said. Priestley is in Morgantown now, the state’s third-largest city at around 31,000. “It’s the worst stuff ever to try to come off of,” said Donnie Griggs, lead pastor at One Harbor Church in Morehead City, North Carolina. And yet, nobody wants to stay addicted. Quigley walks the men through three phases: detox, restoration (residents work through Robert Thune’s Gospel-Centered Life curriculum, learn the physiology of addiction, and get involved at a local church), and discipleship (residents get jobs, attend classes four nights a week, and have regular counseling). Quigley charges $150 a week, which covers about half the cost of the program. He asks residents to stay for a year, because he thinks that’s how long it takes—at least—to establish good habits and practice living off drugs. His program is an alternative to some other Christian programs he’s seen—some “revolving doors,” some asking residents to “vomit out the demons,” some so full of strict rules and consequences that the freedom after leaving can catapult people right back into addiction. When Jason McClanahan came to Charleston, West Virginia, to re-plant Randolph Street Baptist Church, he ran smack into heroin, meth, and prescription pain pills. “We became very frustrated in our efforts at discipling and confronting guys,” he said. So five years ago, the church started researching the best ways to help. They asked social workers and law enforcement, doctors and psychologists. Randolph Street Baptist wanted to address the whole person, “convinced that God created us diverse, complex individuals.” They created Hope for Appalachia, a nonprofit to help men recover from addiction and think through what a Christ-honoring life looks like for them. Determined to give the men dignity, they purchased and decorated three homes, two next to each other, another two-and-a-half blocks away. That one’s already for sale again—turns out it’s “two-and-a-quarter blocks too far away” for accountability, McClanahan said. Hope for Appalachia takes men who have been drug-free for at least a month; leaders aim to help relieve the stress that may have driven them to drugs in the first place. Every element of the residents’ lives has to be addressed from a Christ-centered perspective, from education to employment to family relationships, he said. Hope for Appalachia has been around for 18 months, but is already looking to expand. They have room for 12 men but want to double that number, taking in more men, women, and those who haven’t been able to be 30-days free. But for those who do get in, Hope for Appalachia is with them for life. “Even when they leave us, whether on a good note or a bad one, our commitment is with them long term,” McClanahan said. Quigley says the same. Men who have graduated from Freedom Farm sometimes relapse after they leave, and sometimes they call him to talk it through. Those relapses are a common part of recovery, because the drugs make the brain super-sensitive to anything that triggers a craving, Eames said. “Relapse isn’t a failure, but an event that allows you to learn what went wrong so you don’t make the same mistake again,” he said. He’s optimistic that anyone addicted to opioids can quit. “For a minority of [users], relapse will be a possible problem for the rest of their lives,” he said. The trouble is, when opioid use becomes an epidemic, the small minority is thousands of people. What if You Don’t Have a Recovery Center? Not every church can whip up a recovery center, especially those small churches in rural areas where opioid abuse is most rampant. So instead, Priestley aims for preventative care by providing gospel-centered, grace-filled preaching, biblical counseling, and solid pastoral care. His Crossroads Church partners with other organizations and the medical community. He connected with a recovered addict over a love of punk rock music, invited him to church, and eventually baptized him. Now, grounded in the Crossroads community, the man invites his friends, who are struggling to join him in freedom from addiction. Communities like the one Priestley is offering are “tremendously effective” support for an addict’s recovery, Eames said. Churches can also play a key role in relieving the underlying stressors—financial, relational, spiritual, physical—that may send a person to opiates in the first place. Naming the problem seems to encourage people to come forward to ask for help, though the shame is deep, and extra complex for those whose addictions grew out of legitimate doctor’s prescriptions. That may be part of the reason why “it feels like we are doing more funerals for people than seeing people come out of it,” he said. Wading into the opioid flood can be heartbreaking and discouraging. Progress is slow and riddled with relapses. McClanahan got to watch a now-employed father open up a 529 plan for his 7-year-old daughter. He got to see a young professional find his way past guilt and shame to finally meet his eyes when they talk. And he got to see a 26-year-old—who had been using for 13 years—get his driver’s license for the first time. “Man, if you coulda seen the smile on his face,” McClanahan said. Opioid addiction is both simply sin and also a lot messier than that. The claws of its addiction are especially long and sharp, and often sink in through the innocence of a doctor’s prescription. But the church also has the right answer. Along with providing presence and support, it can point addicts to the only solution for sin. Sarah Eekhoff Zylstra is senior writer for The Gospel Coalition. She earned her master’s degree in journalism from Northwestern University. Preacher’s Toolkit: How Do I Teach Difficult Doctrines without Splitting the Church?